We're just about at the halfway point of 2008 and I thought I'd shed some light on how the mainstream film industry is doing so far... at least compared to last year. 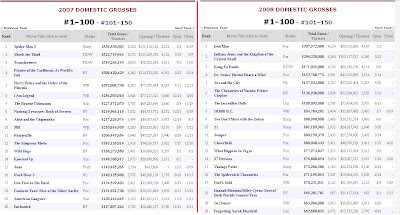 Posted in the picture above is just a comparison of the top 20 grossing movies of 2007, and to this date, 2008. What's interesting is that of the 11 films that surpassed $200 million in total gross, only 3 of them showed favourable reviews (ie. an RT score > 70%); that being Bourne Ultimatum, Harry Potter Order of Phoenix, and Ratatouille. However, 2007 was bolstered by huge threequels which helped earnings by and large. Shift your eyes to the right side of the picture and you'll see how we're doing in 2008. We're halfway through the year and only Iron Man and Indy have crossed the $200m line. Based on the earnings trend of Kung Fu Panda, I'm guessing it will likely pass that line. A lot of "high-profile" movies this summer have bombed critically and financially. I mean, at least in 2007, the blockbusters bombed critically, but still managed to be a financial success. Just looking in the short term future, I'm assuming that Wall-E, The Dark Knight, MAYBE Mummy 3 will pass the $200m border as far as summer releases go. Hancock has a good chance as it's part of the Will Smith steam engine, although some of the advance reviews aren't so hot. Looking a bit further into the Fall and Winter, nothing really jumps out as a surefire hit. Highschool the Musical 3 will probably do well as it makes its big screen debut. Quantum of Solace, The Curious Case of Benjamin Button, Star Trek, and The Spirit will probably all do well, at least $150m each. I'm less pumped this summer to see movies than I was last year. There hasn't been much to go geek over. But alas I can't wait to see Wall-E, Hellboy 2, and Dark Knight.